Just what is Deus Ex: The Fall? We've got no idea, but Eidos Montreal apparently wants us to be very hyped for this thing. That's not much to go on, but as Eidos Montreal is the developer of the current Deus Ex games, and Deus Ex publisher Square Enix recently registered a number of domains using the phrase "Deus Ex The Fall," we're going to feel safe in assuming that it's a tease for the studio's next project. "But what if it's just additional downloadable content for Deus Ex: Human Revolution?" you might ask. That's a good question, and could be a valid explanation, but since it's been slightly less than two years since that game's debut and the last DLC pack for the title was released in October 2011, it seems very unlikely that Eidos Montreal has been working on a solitary DLC addition for that lengthy a period of time. 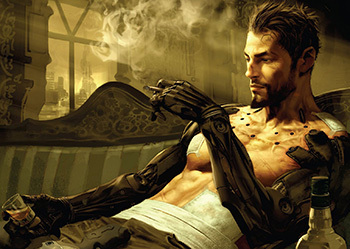 However, those two years seem a perfect amount of time for Eidos Montreal to cobble together another cyberpunk adventure in the Deus Ex franchise, particularly if the firm is reusing assets from Human Revolution or rehashing that game's engine for The Fall. Actually, the most telling part of this entire event is that the annual E3 conference is mere days away. If we had to make a bet, we'd expect Eidos Montreal and/or Square Enix to announce Deus Ex: The Fall at that conference. Whether it will be appearing on current consoles, next-generation hardware or some unexpected platform (like the Vita) is anyone's guess at the moment. Thus, as always when things are unclear, we invite you to speculate wildly in the comments below.